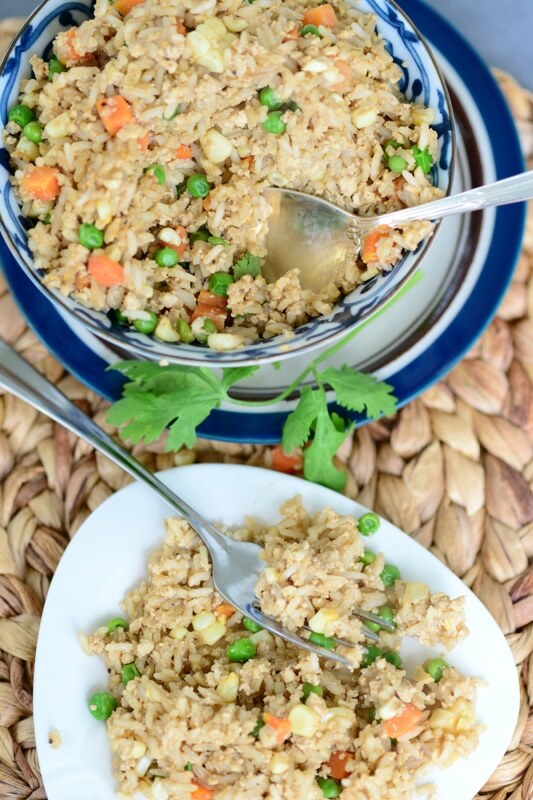 This vegan fried rice makes for a quick and easy weeknight dinner. It’s packed with nutritious flavor from fresh veggies, brown rice, and tofu, then topped with a spicy sriracha-soy sauce. Yum! I just love Asian cuisine in all varieties. 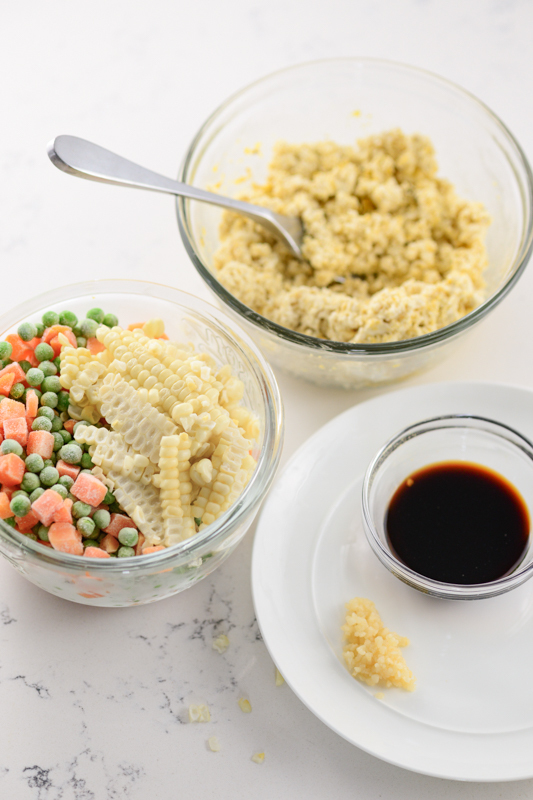 Chinese, Japanese, Thai, Indian – these are some of my favorite dishes to experiment with! Some of my favorite recipes include these One-Pot Thai Green Curry Noodles, Thai Curry Puffs, and Golden Vegetable Curry. 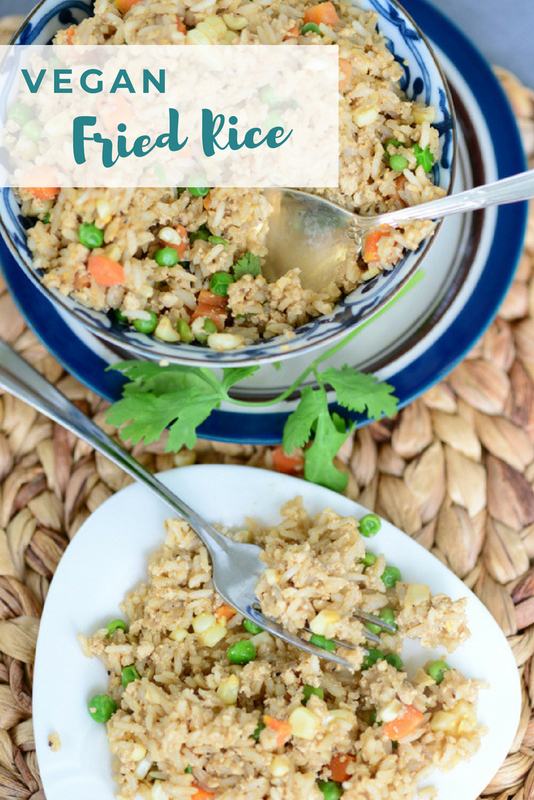 But this weekend I realized that I’ve never posted one of my most basic Asian dishes on the blog – vegan fried rice! I love fried rice, but am sometimes disappointed to find that my favorite Chinese restaurants don’t always offer a vegetarian-friendly version. 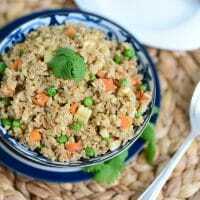 So I created my own fried rice recipe some time ago – and it’s completely vegan. To Tofu or Not to Tofu? Tofu is bean curd made of soy milk and often used in Asian dishes. In this recipe, I used tofu as a substitute for the egg that is commonly found in traditional fried rice dishes. Tofu isn’t super flavorful, but it’s high in protein and iron, so it’s a great substitute for the nutrients you’d get from eggs. Now, if you’ve never cooked with tofu, there are a couple things you need to know. First off, tofu comes in different levels of firmness. 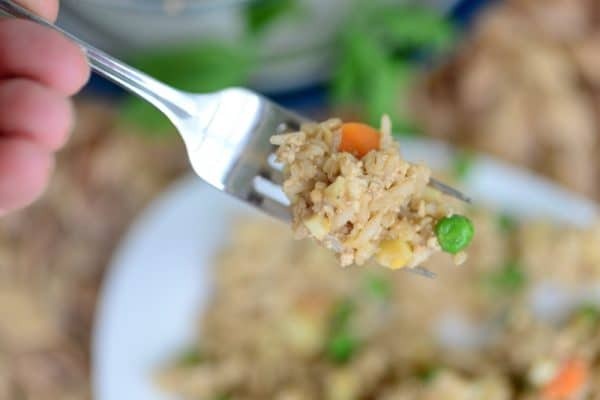 Make sure that for this vegan fried rice recipe you’re using firm tofu – it has the right consistency to replace the fried eggs. However, I know lots of people that just dislike tofu. And that’s totally fine. 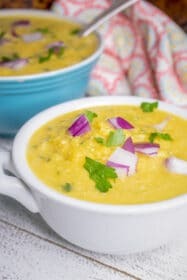 If you are not a tofu-eater, just leave it out of this recipe and it will still taste totally delicious! 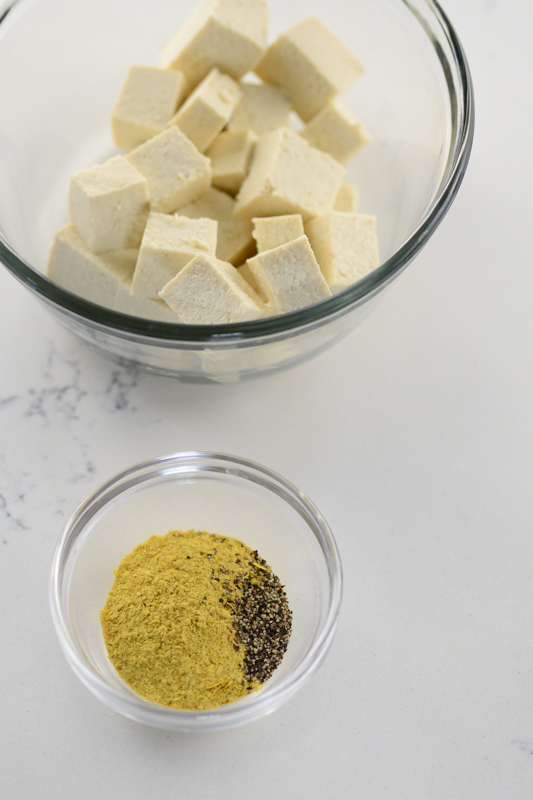 And if you aren’t a fan of traditional tofu, you might also want to check out my burmese tofu recipe, which is a great alternative made from chickpeas. Let’s Make Vegan Fried Rice! 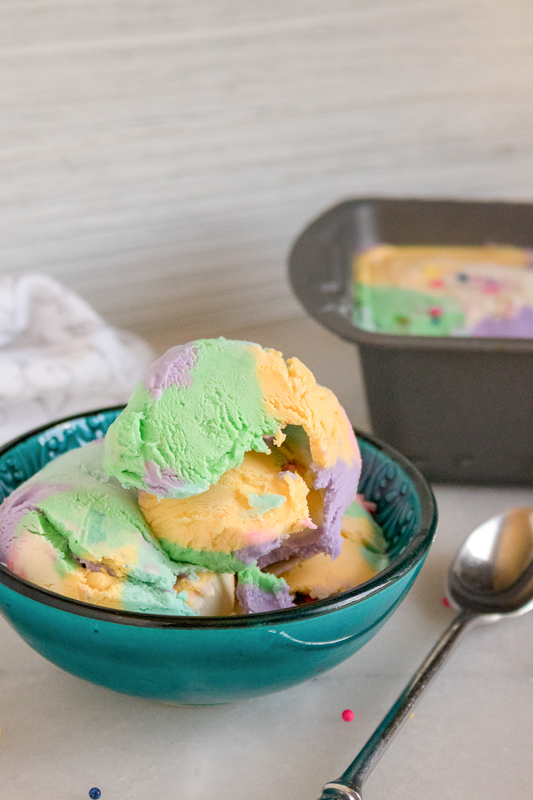 This recipe is not only tasty, it’s super easy to make! Start off by cooking your rice. Feel free to choose your favorite type of rice. Any medium to long grain rice will work well – I used a brown basmati rice. While the rice is cooking, we can start preparing the tofu. Tofu typically has some liquid to it that keeps it moist. So you’ll want to pat it down with a paper towel so that it’s dry. Then cut your tofu block into little cubes. 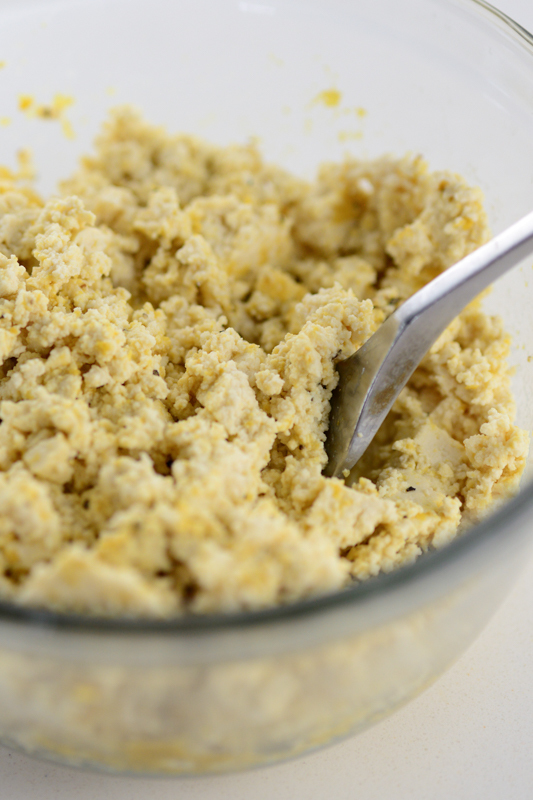 Add the nutritional yeast and black pepper in with your cubed tofu, and mash everything up with a fork. 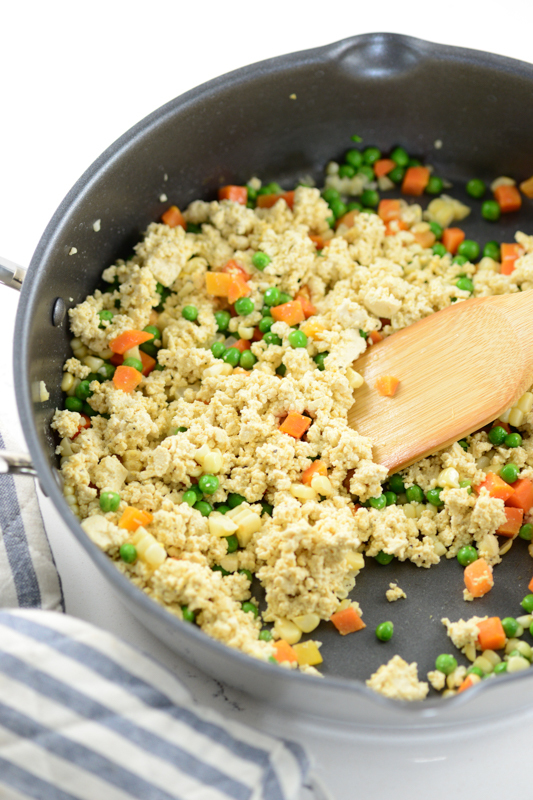 And magically, the tofu will start to look just like scrambled eggs! In a small bowl, mix together 1/2 cup of soy sauce, and a bit of sriracha. This will give the sauce a little bit more kick. You can adjust the amount of sriracha to your own spice preference. Next, prep your vegetables. 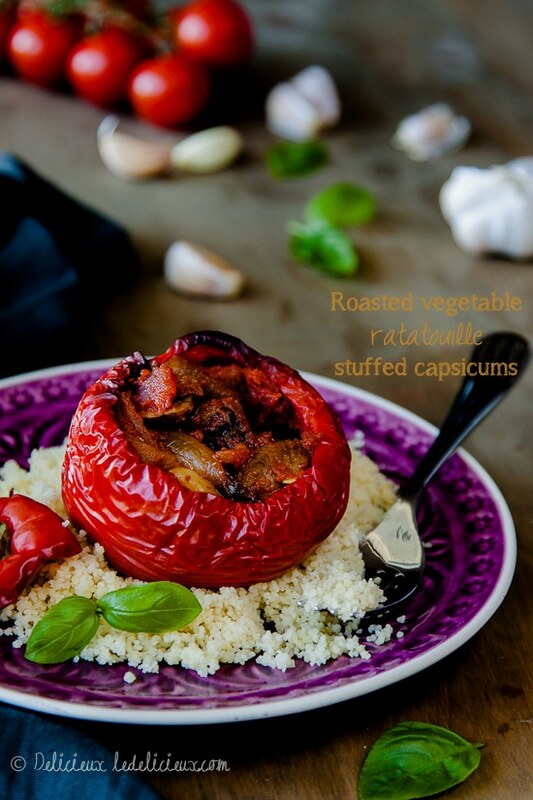 You can use any combination of veggies that you like. For my vegan fried rice, I typically use corn, carrots, and peas. I use fresh corn – and slice the corn kernels from the cob. I think it tastes so much better than frozen corn, and it only takes a minute. But you can use frozen if you prefer. Now that all your ingredients are all ready, you’re ready to get cooking! You’ll need a large frying pan or wok – I like this big, nonstick wok. and add olive oil to your pan. 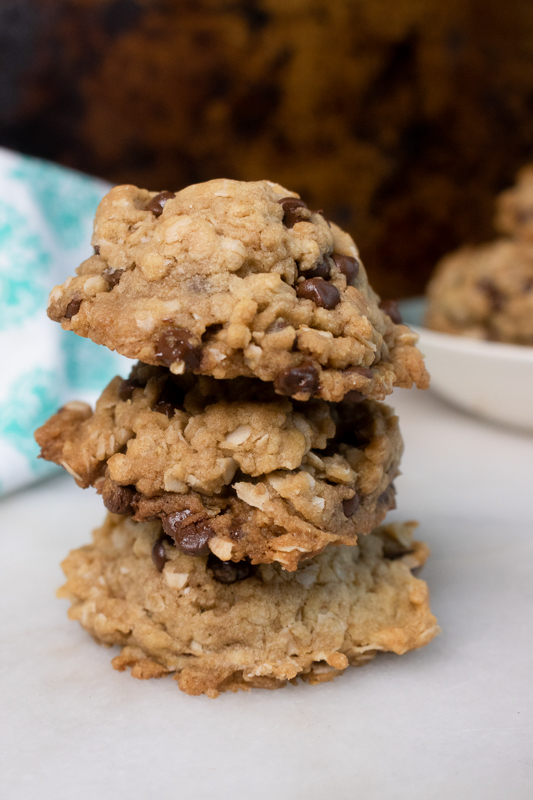 You could add a little extra flavor by cooking with peanut oil or sesame oil – but that’s totally optional. Then add your garlic to the pan and cook for two minutes. This will release the delicious flavor of the garlic and allow it to permeate the rest of the vegan fried rice. 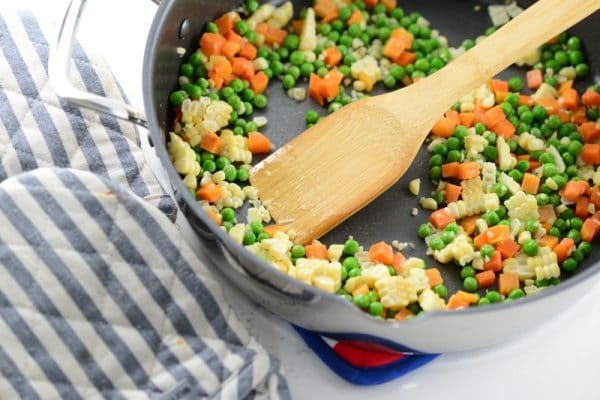 Once your kitchen is filled with the delicious aroma of garlic, add in the peas and carrot. Add the carrots, corn, and garlic to the pan and cook until everything is just softened. Now add the rice to the pan and mix everything together. 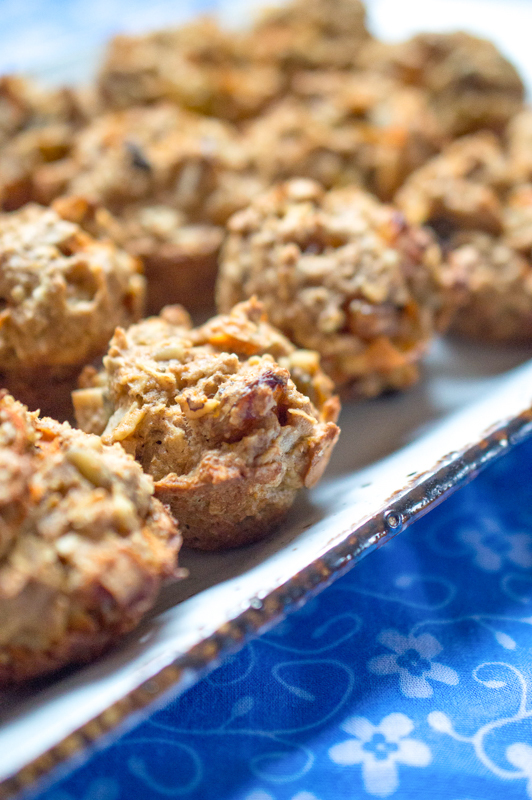 Allow it to cook for just a minute or two without stirring. Finally, add the tofu and sriracha-soy sauce and stir it well. Then let your vegan fried rice simmer for five minutes so the flavors can mix and the bottom of the rice can get just a little bit crunchy. And that’s it – you’re ready to dig into some vegan fried rice! 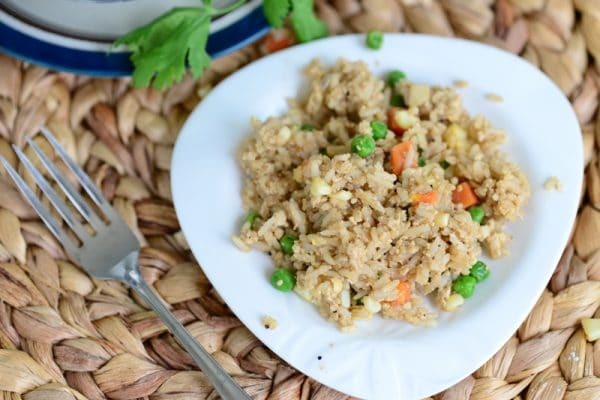 This vegan fried rice pairs great with a vegetable stir fry. 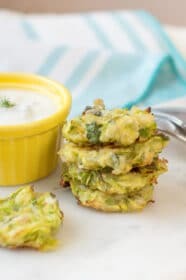 Or you can pair it with some Asian-inspired sides, such as meatless meatballs with sweet and spicy glaze or green bean salad with yogurt miso dressing. 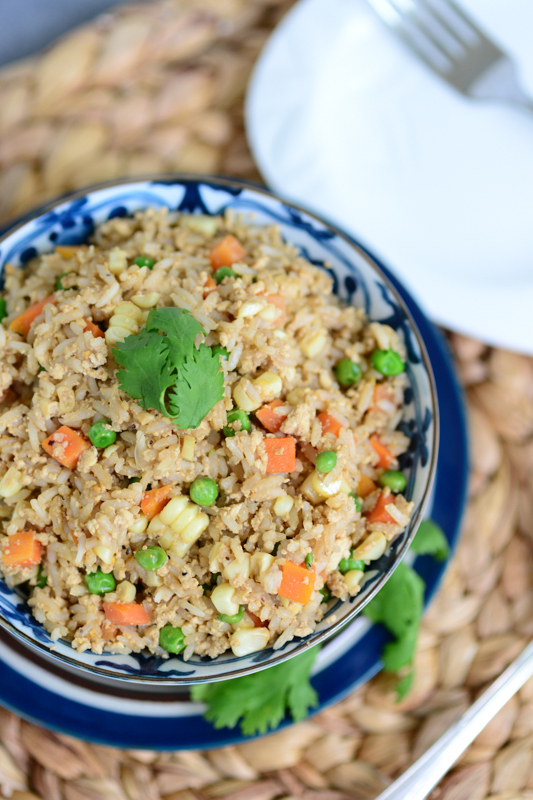 This vegan fried rice makes for a quick and easy weeknight dinner. It's packed with nutritious flavor from fresh veggies, brown rice, and tofu, then topped with a spicy sriracha-soy sauce. Yum! First start by getting your tofu ready. Dry it with a paper towel and cut into little squares. 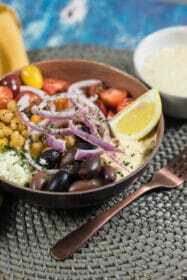 In a medium bowl, mix together the tofu cubes with nutritional yeast and black pepper. Mash up with a fork. Set aside. In a small bowl,, mix together soy sauce and Sriracha. Set aside. Now over medium heat add some olive oil to your pan. Add in your garlic and cook for two minutes. Now add in the peas, carrots, and corn. 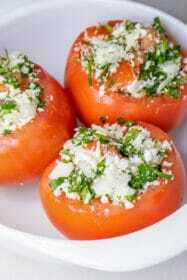 Cook until they are soft - 5-7 minutes. Add the rice to the pan, and mix everything together. Add in the sriracha-soy sauce and tofu. Stir well and let simmer on low for about 5 minutes, allowing bottom of rice to get slightly crunchy. Then take off and serve. Enjoy!